Area K58 contests - results! We had a great session for the Area K58 International Speech and Evaluation contests on Thurs 29 March 2018. We had a full house for the contests, generously hosted by 1st London Toastmasters. Thanks also go to our Contest Chair Vijaya, Chief Judge Chris, mystery speaker Noor, Timers Jeremy & Irem, Counters Vaidotas & Saloomeh plus our secret judges. First and second place winners from both contests will progress to compete at the Division K contests on Saturday 21st April. Want to discover the benefits of finding YOUR VOICE?! 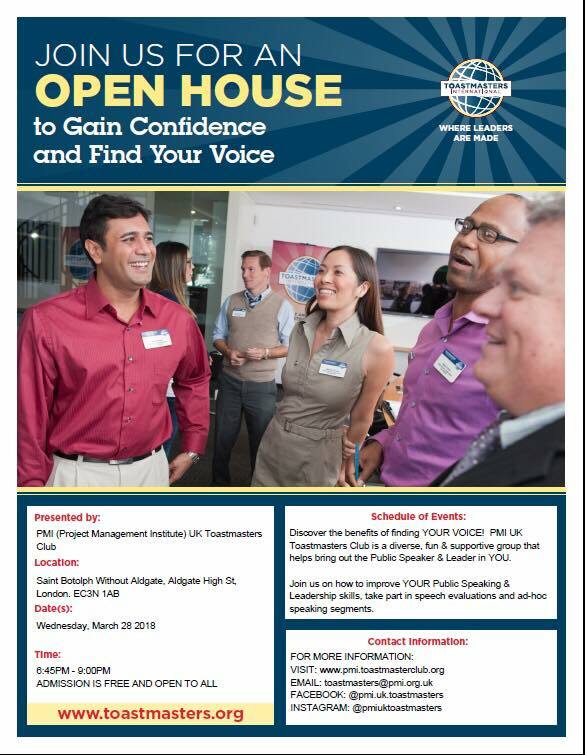 PMI UK Toastmasters Club are hosting an Open House meeting on Wednesday 28 March 2018 and we would love you to join us. Bring your friends, family, and colleagues as ALL are welcome to attend. We are a diverse, fun and supportive group that helps bring out the Public Speaker and Leader in YOU. Join us on how to improve YOUR Public Speaking & Leadership Skills, take part in Speech Evaluations and ad-hoc speaking segments. If you want high-quality feedback, to meet members with experience of the same advanced manuals as you, all happening in an environment that strives towards excellence while being supportive, then PMI UK Toastmasters could be the club to challenge you. We can show YOU that no matter what manual you are working on, it is likely that someone in the club has experience of the same manual. Please join us at 6.45pm doors open for a 7:00 pm sharp start on 28 March at St Botolph-without-Aldgate, Aldgate High Street, London. EC3N 1AB. The meeting will conclude by 9:00 pm and light refreshments will be provided. Area K58 Humorous Speech Contest and Table Topics Contest - results! On Thursday 21st September, Area K58 held their contest, with 5 clubs competing: 1st London, Broadgate, City Speakers, Master Speakers and PMI Speakers. Congratulations to Grant Sidwell from Master Speakers for winning Humorous Speech contest and Patrick Moran from Broadgate Speakers for winning Table Topics. They are pictured with Andy O’Sullivan (Chief Judge) and Christine Harris (Contest Chair). Join us for the next round of the contests. The Division K contest will be on Saturday 21 October 2017. Do you think coming up with a speech idea is hard? What about preparing to present that idea? Finding the right idea or topic that resonates AND preparing for the presentation isn't easy for most of us. What if there was a different approache that required less time with reduced complexity? The presentation lifecycle is a six stage process where you work through ideation, development, preparation, presentation, feedback and reflection. In this workshop we will go through the first three stages. The first stage will help you with an approach in generating ideas for speech topics. The second stage aids you in the development of a speech. The last stage will provide you with a set of tools in preparing, memorising and rehearsing your speech so that you're ready to ace your presentation! Tues 7 February 6.30pm, Workshop The Presentation Lifecycle: from ideation to delivery at City of London Toastmasters, Saint Botolph Without Aldgate, Aldgate High St, London EC3N 1AB. Please come along! Brad Revell has been a Toastmaster for over 13 years with clubs in Australia, Asia, USA and now the UK. He has presented to many Fortune Global 500 C-Level Executives all over the world. On top of his day job in Management Consulting, Brad has been a DJ, a Group Fitness Instructor, a Speed Reading Teacher and continues to consume 75+ non-fiction books a year. Brad is the current area champion for humorous speaking and running up in Division K.